Hoping to find a top broker for my forex trading, I researched a lot of them. I read so many reviews and looked up so many regulation registrations I lost count so I had to put them all in a spreadsheet. Comparing all features, figures, plus and minusus and user reviews. And I decided to let my own observations weigh the heaviest, because I don't trust any internet sites nowadays. I ended up with a list of over 100 that offered Forex trading. But I narrowed it down to brokers focussed on Forex trading, because this is what I was mainly going to do. Although most of these brokers in the newly filetered list also offered precious metals and commodities. Looking at the size, trustworthiness and overall user satisfaction I tried a couple. Opened a demo account and did some random trades. 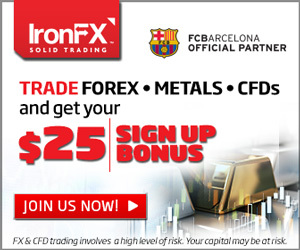 In the end I was most satisfied with IronFX and their overall system. I contacted support to ask them some simple questions and opened a live account. Which I am using to this day to trade. Twice so far I took out my profits, without any problems. And I hope my little adventure in finding the optimum broker for me can help someone else find a good broker. I went with them because many people trade with them. no regrets so far. quick withdrawl too. Super happy. made some great profits with them. I do recommend you open a live account with them.